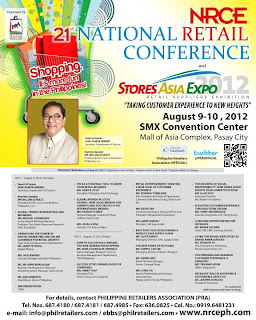 The 21st National Retail Conference (NRCE) and its twin event, Stores Asia Expo will be held on August 9-10, 2012 at the SMX Convention Center, SM Mall Of Asia, Pasay City. As such, the retail industry is expected to take on new heights as it highlights why shopping is more fun in the Philippines. New avenues for making distinctive customer experience is the top bill of this year’s retail conference as NRCE takes its cue from the Philippine government's “It's More Fun in the Philippines” campaign. Following two successful NRCEs which zeroed in on Asian brands, this year's gathering moves forward with talks on personalizedbranding and transforming employees into brand ambassadors. Participants will also gain more insights on the competitive edge of socially responsible businesses and the retailers' role in advocating a sustainable lifestyle. Tourism Secretary Ramon Jimenez will be speaking on the campaign's synergy with retail industry growth as Mr. William Schultz, President and CEO of Coca-Cola Bottlers Philippines Inc., delivers the conference keynote message. Coca-Cola’s participation in this year’s NRCE is expected to further elevate the “fun” aspect of the conference as the brand celebrates “100 Year of Happiness”. Meanwhile, Emmy award-winning television producer of The Tyra Banks Show and the widely popular fashion reality show America's Next Top Model is set to share the newest developments in marketing and branding and global opportunities for Filipino brands. Retail industry experts to share insights on elevating customer experience. Hans Sicat, president of the Philippine Stock Exchange, is among NRCE topbilled speakers. He will tackle “IPO as a Strategic Tool to Grow Your Business” on Day One at the SMX Convention Center. Atty. Paul Santos, chairman of PRA’s 21st National Retail Conference and Stores Asia Expo (NRCE), said that the use of initial public offerings (IPOs) as a tool for retail business growth will surely help retailers respond to challenges of expansion. The second day of conference will feature luminaries from retail and property development. Entitled “Retail Entertainment: Creating a New Level of Customer Experience," the morning panel discussion explores how shopping and leisure are intertwined. The conference’s last panel discussion entitled “The New Turks of Retailing,” is set to put participants in a forward-thinking mood. It features the young entrepreneurs behind today’s hot brands and franchises. Moreover,the value of customer service to the overall shopping experience will be acknowledged. This annual event gathers the people behind the companies that have established excellent track records in customer satisfaction. With the event aimed at highlighting and heightening the fun shopping experience here, it is expected to engage a handful of new generation shoppers. The local retailers with surely benefit from the increase of tourist arrivals and consequently from the shopping bills of tourists. Organized by the Philippine Retailers Association (PRA) and supported by PLDT Alpha Enterprise, SM Department Stores, Robinsons Malls and HP Philippines. Its twin event, the Stores Asia Expo, is presented by Bayan Telecommunications, APL Logistics,Heritage Multi Office, Infinite Grafix, Live Media, Q Creativs,Starmall, Media Magnet, and Catalyst Media. The 21st NRCE is also sponsored by DHL Supply Chain, Festival Supermall, Celine, Wilcon Depot, ForMe, The Philippine Star and BusinessWorld. The NRCE is the country's biggest retail industry event. Over 800 retail owners, suppliers, CEOs, and top level executives from all over the country are expected to attend this conference. 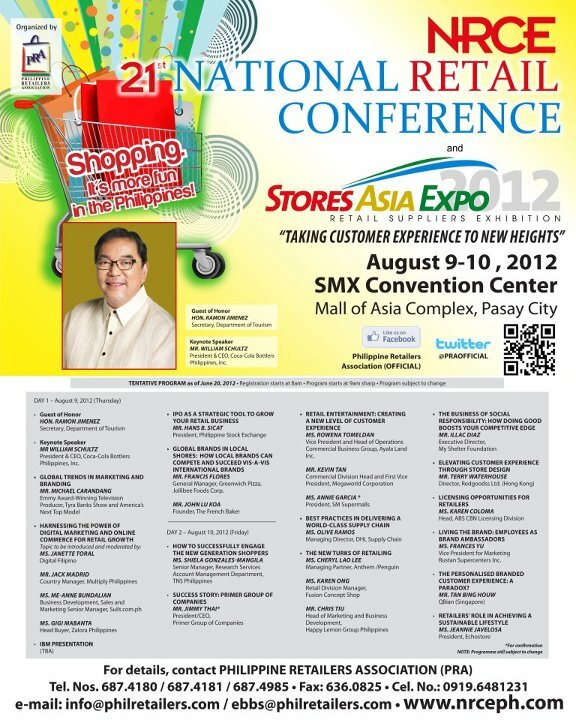 For registration and more information about the 21st NRCE visit www.nrceph.com You may also call PRA at 687-4180/4181 or e-mail info@philretailers.com or ebbs@philretailers.com. This is very helpful for the retailers and any one in the industry. This is also awareness in what are the needs or improvement that a retailers can learn to other retailers. Attending exhibits and conferences really help a lot to both the parties.